Home Health Opinion poll Man with his heart in a bag pack!!! Man with his heart in a bag pack!!! 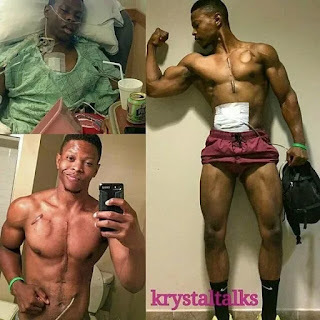 A bodybuilder who suffered heart failure was rushed to hospital for a transplant – and now has an artificial heart he carries around in a backpack. Andrew Jones, from Conneticut, first became unwell in 2012 after struggling to breathe during a run. He was horrified when two years later he started to cough up blood and developed a high fever. In hospital, doctors diagnosed the 26-year-old with cardiomyopathy – a hereditary disease of the heart muscle – and soon he became so weak he couldn’t stand, walk or dress himself. A few months later, medics told if he didn’t have a transplant immediately he would die. As there were no organs available, he was fitted with a pacemaker and an artificial heart – which he now carries around in a bag on his back. Despite his brush with death, he is now back to the gym and said he cries after workouts as he feels so ‘thankful to be alive’.